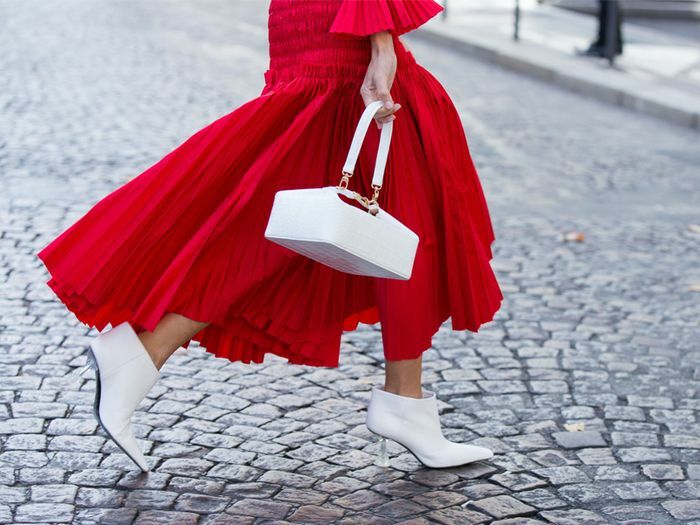 If you're trying to please a fashion fanatic this holiday season (or simply compiling your own list), chances are that they're already 10 steps ahead of you when it comes to the trends, labels and must-haves to own. Tricky doesn't even cover it. But you can have them bursting with excitement when opening a gift, and it needn't cost you the earth. So where do you start? With fail-safes such as accessories and lingerie (you can't go wrong with leopard-print and silks right now). And with sunglasses and earrings, you don't need to worry about sizing. Where designer bags are concerned, a diminutive cosmetics case will make a big impact and can also be used as a clutch. Or look to mid-range brands like Staud for a cool, trendy piece. Timeless items like leather jackets, sneakers and logo tees also always guarantee success. With all that in mind, hopefully, your gift-buying headache will subside. As ever, if you scroll below, you can get a head start on our edit, bursting with all the inspo we think you'll need. Because you can't have too many sunglasses. Okay, so Staud's bags aren't high-street prices, but they're a fraction of the big designer heavyweights (and achingly cool). Putting the chic into festive knitwear. The modern way to gift pearls. Looks so much more luxe than high street. Clutch, wash bag or pouch? This chic little bag is a real multitasker. Logo tees + Isabel Marant branding = a gift anyone would love to receive. If they don't own a leather jacket yet, this one has all the classic details and comes in at under £200. If they already own tonnes of white sneakers, try these for a surprise. Classic hoops with a desirable twist. We challenge anyone not to be delighted with this beautiful bra. If they haven't already heard of Singapore accessories brand Charles & Keith, this will mark you out as a gift-giving maverick. Wrap these up in tissue paper and they'll never guess they're from Mango. Kimonos are almost always trending, and this can be effortlessly dressed up or down. Plus, you needn't worry about getting the perfect fit. The bag shape of the season (and in proper leather, to boot). Ghost is the affordable label enjoying a moment. Trying to please a shoe fanatic this holiday season? Here's what our money's on.